Sunday, May 21st will be the day of the Mille Miglia for Mantua, Canneto, and Guidizzolo. 450 vehicles, representing thirty-nine nations and five continents, will cross the province starting at 9:50am. 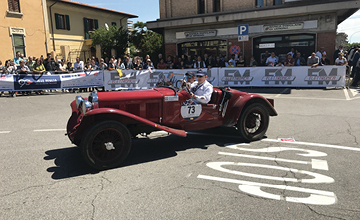 The caravan of historical racing cars, which will drive through more than 200 municipalities, seven regions of Italy, and the Republic of San Marino, will make a stop in Canneto sull’Oglio, where the first car is scheduled to pass through at for 9:55am, then in Mantua in Piazzale Sordello where – around 10:50am the participants will begin to arrive and, finally, in Guidizzolo where the cars will drive through starting at 11:25am. Elettronica FM will sponsor the event, in collaboration with the Municipaity of Guidizzolo.